On 29 April, 2010, PNND organised a one-day Nuclear Weapon-Free Zones Civil Society Forum to explore the lessons from the existing NWFZs, the possibility of establishing additional NWFZs, and the role that NWFZs can play in achieving a nuclear weapon-free world. The event was co-sponsored by the Permanent Mission of Chile to the United Nations, the International Association of Lawyers Against Nuclear Arms, and Mayors for Peace. 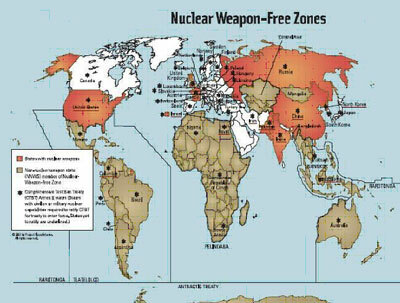 Nuclear Weapon-Free Zones (NWFZs) are a stepping stone to a nuclear weapon-free world. They create whole regions where the deployment, use and threat of use of nuclear weapons is prohibited. They provide regional security mechanisms. They help build a global norm against nuclear weapons and confidence in the global abolition of nuclear weapons. The Report and Recommendations from the Civil Society Forum were presented by PNND former President Alexa McDonough to the Conference of States Parties to NWFZs held on 30 April. 113 countries are part of NWFZs comprising Latin America, the Caribbean, the South Pacific, South East Asia, Africa, Central Asia and Mongolia. Antarctica, the Sea Bed and Outer Space are also NWFZs. The Conference of States Parties to NWFZs was the second time these countries had met to discuss ways to strengthen existing NWFZs and promote nuclear disarmament. The Outcome Document agreed by the Conference of States Parties to NWFZs along with the Civil Society Forum recommendations (included as an annex) were submitted to the 2010 Review Conference of the Nuclear Non-Proliferation Treaty by the government of Chile. View a gallery of photos of the event.